Bronze Award for the Visitor Guide. Project initiated in collaboration with the Regional management team. The aim was to ease the visitors commuting and new hired integrations to the Building based in Dublin. The impact was regional as other site decided to align they presentations. Congratulations to the Green Team! Congratulations to the Cherrywood Green Team who won the Waste Prevention Award at the 2011 Envirocom Awards. The win was based on Dell’s ambitious global goals to reduce waste while supporting good environmental stewardship. The resulting win was a real team effort and included strong collaboration between Cherrywood and Limerick. Led by Jean Cox-Kearns, Dermot O’Connell and the Cherrywood Green Team and Jim Quirk & Tom Moriarty in Limerick,.. it was a super win. Representing Dell and taking part in the celebrations were; […] Alexandre Mitellus, […]. Well Done Team! Project Initiated and sustained From 2008 until 2014. This article was the consequence of our extension in 2010. Today marked the official launch of the Dell Car Pooling website in Cherrywood. The website was the idea of Dell employee, Alexandre Mitellus, who entered an internal competition organised by the employee led ‘Green Team’. The website was deemed such a good idea the ‘Green Team’ went about implementing and designing the website in partnership with the Dublin Transportation Office. The Car Pooling Website was customised solely for Dell, it has been tried and tested and incentives for employees are in place to encourage them to use it. A monthly raffle for a car valet is up for the taking and the option to secure preferred car parking spaces. Dell has committed to becoming the world’s greenest technology company and making company operations carbon neutral by the end of 2008. Dell are already ahead of schedule and this not only reflects in the measures undertaken by the company globally to ‘green’ its own operations, it also includes a commitment to helping customers achieve their environmental goals through the provision of environmentally sound solutions and products for all customers from the largest corporates to individual consumers. United we Drive – Divided we stall! 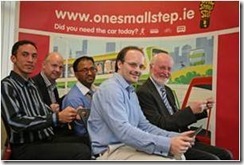 The Dell Ireland team launched a car pooling website last week. The website was the idea of Dell employee, Alexandre Mitellus who entered an internal competition organised by our local ‘Green Team’. The suggestion was deemed such a good idea that we designed and implemented a programme for Dell employees in partnership with the Dublin Transportation Office. A monthly raffle prize has been put in place as well as other benefits to encourage employees to use the scheme and we already have over 100 employees using the site. I have been pleased with the feedback from Dell employees and the local media, for example here is a post from TechCentral.ie. Dell has committed to becoming the world’s greenest technology company. Earlier this year we announced that our global operations are carbon neutral. We did this through efficiency projects, and purchasing green power and then responsibly offsetting any remaining emissions. Only with our employees behind initiatives like this can we continue to drive efficiencies in our own operations. There is so much more we can all do – and with the rise in petrol prices that many countries are experiencing, this is a win-win scenario for our pockets and the environment. Pictured: Driven to act – Alexandre Mitellus, Denis Lucey, Sarda Gukhool, Michael Halpenny and John Henry.